Price Paid: Around $40 or $50, I think? 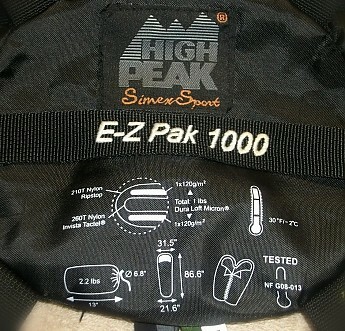 The High Peak E-Z Pak 1000 is a very good, well built, warm weather sleeping bag if you are big enough to fill it up. The construction quality, price, features, and durability are excellent, but the temperature rating is very optimistic. 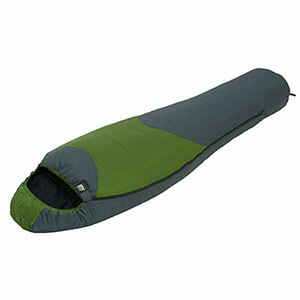 I recommend this sleeping bag only to the "big and tall" crowd. First of all... ALWAYS use a sleeping bag liner! 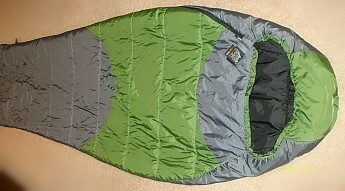 A sleeping bag is an investment—usually an expensive investment. 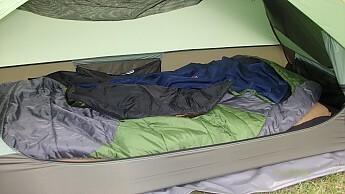 The insulation in a sleeping bag, whether down or synthetic, has to be able to create dead-air space to keep the warm air in and cold air out. A bag's insulating efficiency is dependent upon its ability to "loft". Loft is the "fluffiness" of the insulation, and is what creates that dead-air space. 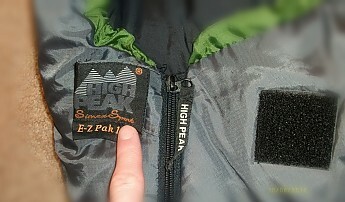 I am pretty familiar with the High Peak brand. Well, with their sleeping bags, anyway. I've purchased five (5) or six (6) of the Alpine Pak 20 degree bags, and still have three (3) of them. Besides those, I also have this bag, and a Sirius warm weather bag (which rarely gets used because my Deuter DreamLite 500 is better, lighter, and more compressible). 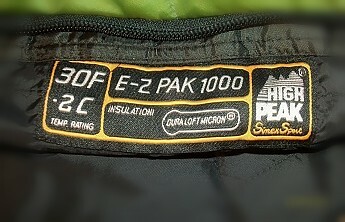 In all of that experience with this brand of sleeping bags, I have noticed that the stated temp ratings are 15 to 20 degrees (F) lower than what you can expect to be realistic. And this bag is no exception. In the above photos, you will see that this bag is rated for 30 degrees (F). Ignore that. Actually, ignore most of what the manufacturer states. Well, except this part: "Temperature rating is based on enclosed environment with mattress." It's a good looking bag that has held up well. I bought this bag back in 2010, and have used it several times per year since then. I'd say that's pretty durable. 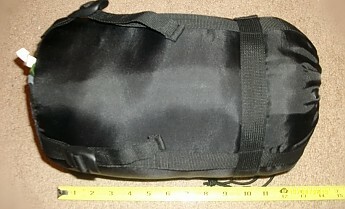 I've used this bag more than any of my others, with the exception of my Deuter DreamLite 500 bags. Now, granted, the majority of my use of this bag has been indoor (sleeping on the floor at someone else's home, sleeping in hotels/motels, etc.) I have used it outdoors, but not very often. ... a functioning hood cinch. 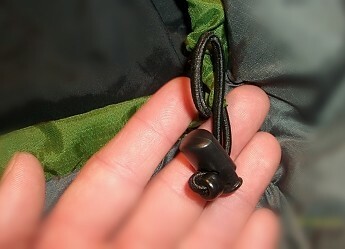 It is a single elastic cord folded over at the end to double it, with a standard barrel lock. No problems here–it works as designed. 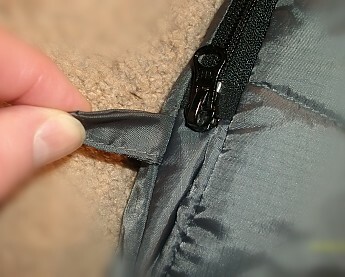 Here you see the zipper guard, with a "grab tab", in the closed position covering the zipper. ... fold the guard over onto itself. This keeps the hook part from snagging everything that gets near it. And it will! Also note the large fabric zipper pull. No problems finding or holding on to this zipper! Speaking of zipper, I have seen many reviews (elsewhere) of this bag, and everyone complains about the zipper snagging the inside material. I have not had any problems with zipper snag on this bag. 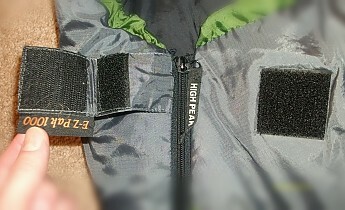 The zipper has a full length anti-snag flap, that apparently works. For me, anyway. The zipper ends 13" from the foot end of the bag. This is typical of cold weather bags. Not that this IS a cold weather bag. 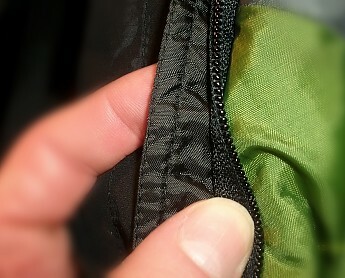 At the foot end of the zipper there is a little loop of fabric for... ? A pull tab to hold while you operate the zipper, maybe? I have no idea what it is for! Here you see the round shape of the footbox. It's not my favorite shape for a footbox, but it is very typical. Also note the two (2) hang loops for storage. NEVER store a sleeping bag compressed! 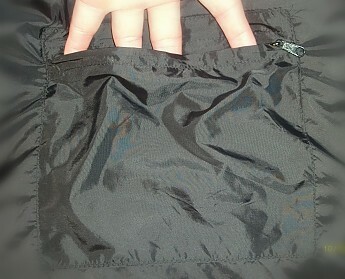 On the inside of the bag there is a zippered chest pocket for storage. It has a large enough opening (~6.5") for your hand, and it's not so deep (6") that things will get lost inside. It's a good pocket. This is a very wide, very long bag. It has a very "relaxed mummy shape" that doesn't start to taper until approx. 2/3 of the way toward the foot end. Plenty of room, but not efficient. 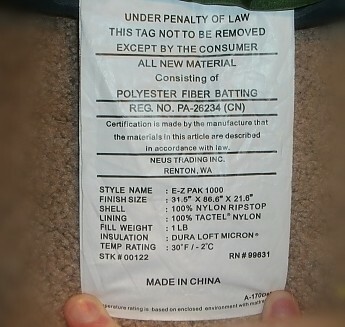 It is not labeled as, nor was it advertised as, a "Long" or "Large" (big and tall?) version, but it has the dimensions of one. And because of the cut of this bag, those measurements decrease very little when you are actually inside of the bag. When using the bag, I have about a foot (12") of extra space at the foot end, and more extra space than I need in the shoulder to hip area. This excessive length and width come at a price—cold spots. It's hard to keep this bag warm unless you are a pretty large person. And that is the reason I rarely use this bag outdoors. I just can't keep it warm enough. That is also another reason this bag will not work at its stated temp rating of 30 degrees. 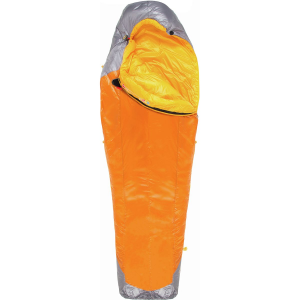 A decent compression sack is included with this sleeping bag. It works great, but as with the other compression sacks that I have from High Peak, the stitching of strap to sack is not very good. Every time I use one of these compression sacks, the stitching looks as if it is about to rip free at any moment. I say that, but yet here it is 5 years later and they are still holding! The bag inside its compression/stuff sack. Uncompressed, it measures approx. 7.5" x 13". Once you compress it, it gets down to approx. 10.5". 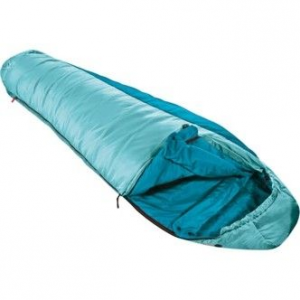 It is plenty small enough to fit in the "sleeping bag compartment" of most packs. In the stuff sack, my scale consistently measured 39.5 oz / 2.46 lbs. That's pretty heavy when you consider that this is NOT a 30 degree bag as stated, but more like a 45 or 50 degree bag. 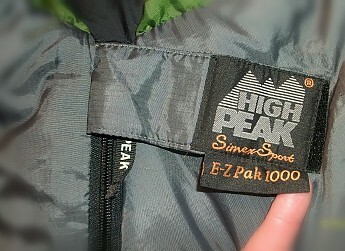 For a "cheap" brand, High Peak makes a very good bag (other than the insulation/temp ratings). The design is good, construction is good, and they include many nice features and/or accessories that you typically only find on the "big name" (and therefore big price-tag) company products. I paid somewhere around $40 or $50 for this bag new (I don't remember exactly). The price was right, the features are good, and the weight... well, the weight is a little high. 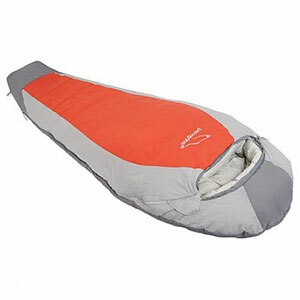 All in all, this is a very good, well built, quality sleeping bag. I do not regret buying this bag! My daughter and I both have gotten a lot of use out of it, and it has held up well. I can't possibly give this bag 5 stars, simply because of the misstated temp rating. Add to that the weight and the excessive length and width, and you see the reason for the 4-star rating I gave it. But as for construction quality, price, features, and durability... it deserves 5 stars. 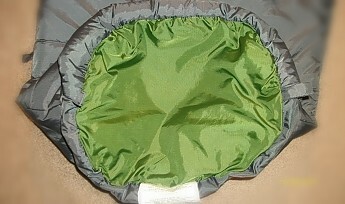 Here you see my Chinook Pongee Mummy Liner paired with my High Peak E-Z Pak 1000 Sleeping Bag, on top of my Nemo Cosmo Air & Pillowtop 1P sleeping pad, all within my Eureka! Backcountry 1 tent. The E-Z Pak 1000 has been discontinued. 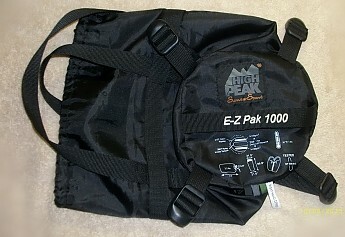 The High Peak E-Z Pak 1000 is not available from the stores we monitor.